So you’re sick of utility companies’ soaring electricity rates and have decided to reduce your carbon footprint by utilizing solar power… fantastic! Once you’ve discovered how much you can be saving with a solar savings calculator and ready to speak with a solar installation expert, you’ll want to be familiar with the different types of solar panels available. A solar expert can help you determine which will be best for your rooftop. There are three different types of solar photovoltaic (PV) systems used on homes, Monocrystalline, Polycrystalline, and Thin-Film. All of these big words just basically mean that they’re based on a variation of silicon. According to the National Renewable Energy Laboratory, most of the world’s photovoltaic today is based on silicon, and about 95 percent of all U.S. manufactures to residential sectors were crystalline silicon solar panels. What differs is the purity of silicon in the PVs. Monocrystalline solar panels are made out of the highest-grade silicon and efficiency rates are typically around 15-20%. They’re also considered to be very space-efficient and to have the longest lifespan, with most warranted for 25 years. Monocrystalline solar panels are also the most expensive however, and have a very low tolerance for shade, dirt, or snow. They are very sensitive to being covered and can even break down if affected by the elements. Polycrystalline silicon solar cells are another type panel that you’ll probably have the option to install. They cost less because the process used to make them is simpler. You may find in research that they perform worse than monocrystalline panels in high temperatures, but this effect is very minor and will most likely not affect the type of system you will install on your home. They are slightly less efficient and have a lower space-efficiency, meaning you’ll generally need to cover a larger surface to output the same power you’d get with monocrystalline silicon panels. 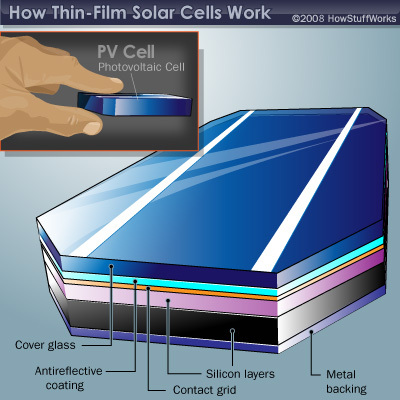 Lastly, thin-film photovoltaic cells are built by depositing layers of a light-absorbing material onto a substrate, such as coated glass, metal or plastic. Remember that small, black solar cell on your old solar-powered calculator? Same thin-film technology! Production modules of all thin-film technologies have a lower output per unit area than crystalline silicon modules, but can be lower cost in dollars-per-watt. This technology is great in certain industries, but not very practical for more residential situations, since they require so much space. They also degrade faster than mono and poly crystalline panels and typically come with a shorter warranty. What to keep in mind when shopping for solar panels: monocyrstalline panels are a little more expensive, but slightly more space efficient. For instance, one 220-watt monocyrstalline or polycrystalline solar panel will generate the same amount of electricity, but the monocrystalline one would take up less space. And although the thin-film solar panels are functional, they do take up much more space and probably aren’t a viable option for a traditional homestead. The advantages of solar energy are vast and its an exciting venture to take on. Remember, you can always speak with a certified solar panel expert in your area by filling out the form at 123solarpower.net.